At the core of our children’s non-learning problems is the inability to read properly. By the end of the next administration (SY 2015-16), every child passing pre-school must be a reader by Grade 1. Essential to this, we must build a library infrastructure in our schools, procure reading books (from our Philippine publishing industry to support local authors and publishers) and train our elementary teachers on how to teach reading. 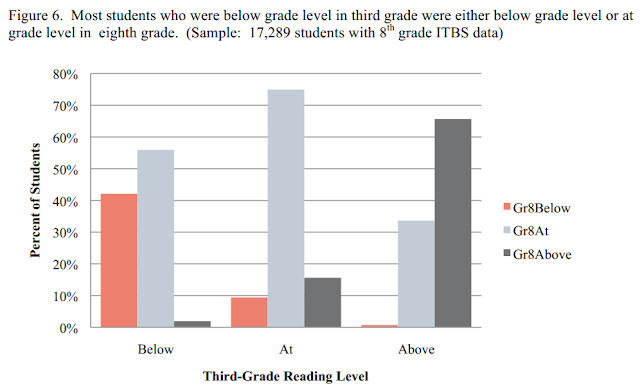 More than 4 out of 10 students who read below third grade level do not do well in grade 8 while only 1 out of 10 students who read at third grade level fails in grade 8. The next question is what is reading at the grade 3 level. The Chapin Hall study specifically used the Iowa Test of Basic Skills (ITBS). 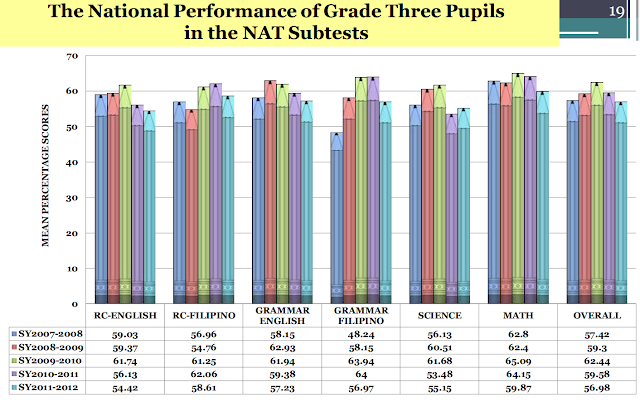 The Chicago students who scored 24 percentile and below compared to the national scores were considered as below, those who scored 25-74 were considered at the level, and those who scored above 75 percentile were taken as above the reading level. Watch Ohio Third Graders Must Learn to Read or Repeat the Year on PBS. See more from PBS NewsHour. In the video, one principal, Ruthie Jackson describes the enormous pressure brought by the new law on schools. She states that in her school district, almost half of the students in kindergarten through grade 3 are reading below their respective grade levels. Interventions are therefore necessary. There are reading specialists but their number is quite few compared to the needs of the schools. There is only one per 100 students who are struggling. Tulenko then estimates that this means a reading specialist sits with a struggling student only once every 18 days. The state of Ohio has provided tutors who visit students 2 hours per week but budgetary problems have removed these services. It is estimated that for the state of Ohio to meet the expectations of the reading law, 50-60 million US dollars are necessary. This is for a state that has about 130000 students enrolled in third grade. Part of the challenge in Ohio starts with preschool. Only 6000 out of 26000 eligible preschoolers receive free preschool education. 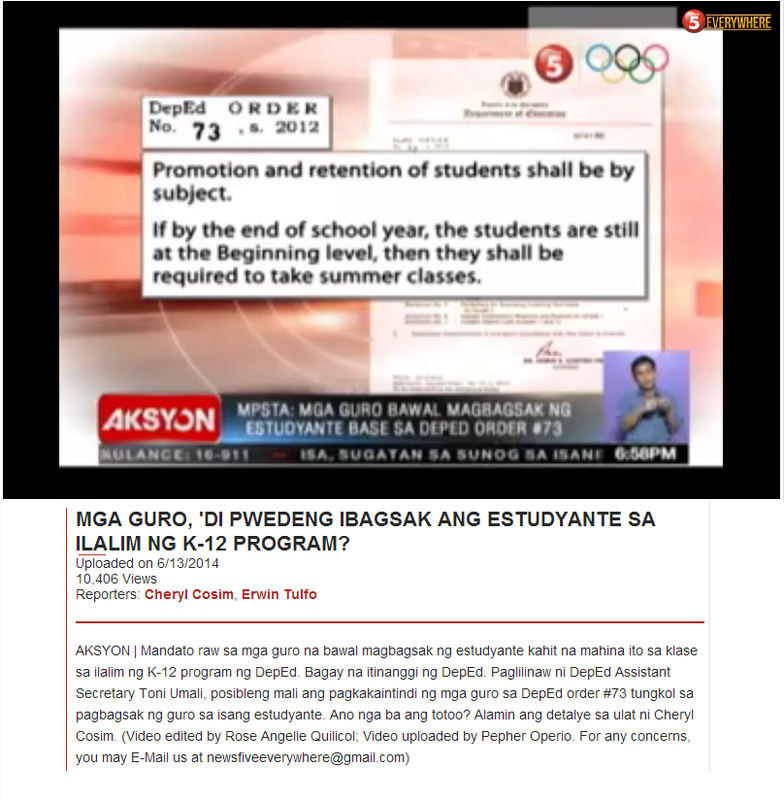 Some are very apprehensive about the law, concerned that retention will lead to an increase in school dropouts. But Ohio is following the data from Florida where such a law has been in existence for years now, and Florida's reading law seems to be quite effective. But as the video points out, Florida invested a lot more, providing additional interventions and summer schools for struggling students. A politician can dream as much as he or she wants, but the dream must be first clear. And in the end, the dream can only become real with adequate support and funding.